I’m partial to polka dots, so I leave the dandelions alone. My next-door bunnies are partial to dandelion leaves, so I often see their polka-dot tails in my yard. When I sit in my favorite chair, I can see the backyard through the large picture window. A chain-link fence encircles the yard, dividing it from the empty fields to the east and south. 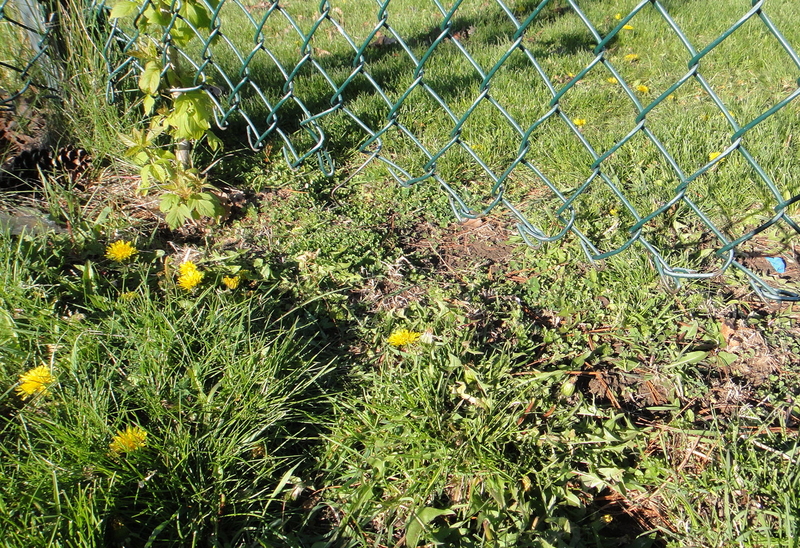 The uneven ground beneath the fence provides a portal for the bunnies to squeeze through and enjoy the green buffet that we provide. An open door for bunnies. Earlier this month, the weather warmed and my husband cut the grass: the first of the season. Mixed in with the cut grass were handfuls of rabbit fur that once lined a shallow depression in the ground: a former birthing center for rabbits. Now they live in the further field, near the neighbor’s lilac bush. In the soft light of late afternoon, one or more bunnies slide under the fence to eat. 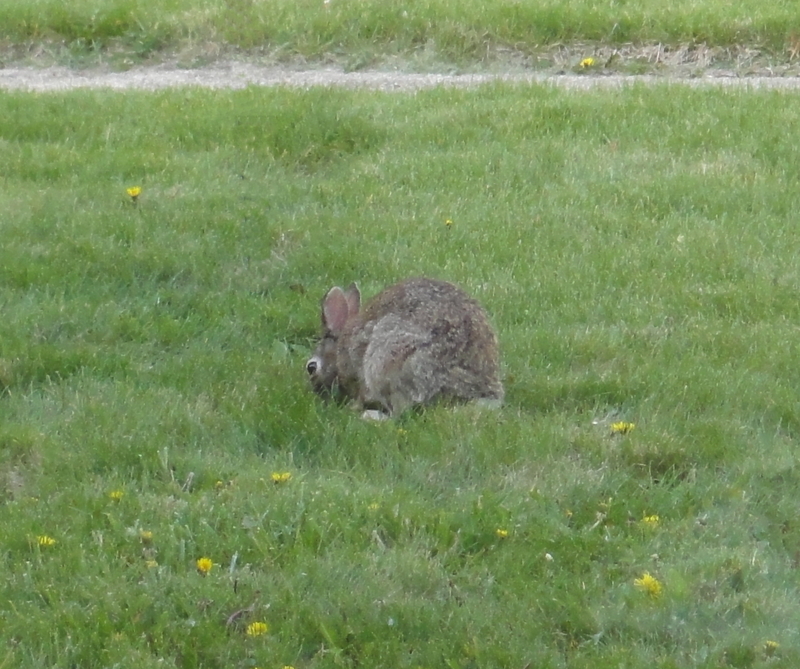 Last week I spent thirty minutes in my chair with my binoculars watching a lone bunny in the yard. The yard bunny as seen through my window. He tiptoed near the fence looking for something good to eat, wearing earth’s own colors – raincloud gray, sandy brown, and sandpiper buff, all detailed in either onyx or snow. Seen through the binoculars, his fur bore a pattern like feathers, and when he raised his head, ears erect, turning this way and that, I half expected him to fly away. He nibbled on some dandelion leaves and chewed so rapidly, it seemed a kind of mincing. Often he lifted his head and scanned the skies and yard. He read the trees and clouds with his large brown eyes and studied all its smells with his ever twitching nose. I have seen a hawk or two fly overhead on other days, and I suppose he has as well. Satisfied that he was safe, he settled into himself, sinking into a mound of fur, his ears like tiny horns, and rested in his stillness. Sitting sphinxlike in the yard, I thought he looked magisterial, small in size but great in wisdom. Then he flared his nose and let loose ripples of twitches that rolled over his body, as if he had held his giggles long enough and now must return to his bunny ways and leave wisdom for the owls. After grazing a bit more, he sat up, fluttered his two front paws and licked them. He groomed himself as carefully as a young man on a first date, then froze, suddenly remembering that the world must be watched. More of the bunny through the window. I could have watched much longer, but he had other places to go. Turning back toward the fence, he showed me his improbable tail: a cotton ball glued on by a child’s hand. I waved goodbye and turned back toward my book. Every evening I look for the rabbits, delighted that we share the world together. I know that dandelions and rabbits are often called pests, and perhaps they are, but they fill my heart with wonder. In my own way, I think the world bears watching. “………..and now must return to his bunny ways and leave wisdom for the owls.” Love this bit! Thank you for this lovely reverie! We’re squirrel-watchers ourselves (and of course birds), with the occasional bunny, occasional skunk, occasional raccoon (sometimes nose pressed against our French door! ), occasional deer. It’s all pretty wonderful. How wonderful to be able to watch all that wildlife. Outside of squirrels and birds, we have the bunnies and, on a rare occasion, a wild turkey. That always surprises us because we live in the city. We are lucky to have the the small fields on either side. I’ve heard some people say. “Let’s dig them out and mow them down. But dandelions are friends of mine. I’d save them if I could. What a fun poem! I must check out your book. This filled me with joy. Really! I love your descriptions of the rabbit’s movements and behavior. At times I thought what a cute book for children it could make, a story about bunny movements. There are more ways to describe what bunnies do, as you have shown here…they do not just hop, hop, hop! I will come back to read this more than once, I believe. So lovely. Thank you, Ashley. I could have watched that bunny all day. And I am so grateful for binoculars, so I could see it up close. I enjoyed being with you as we watched the bunny. Thanks. Thanks, Myra. I’m glad you watched with me. Beautiful words! As a passionate animal lover (all kinds, there are no pests — just animals who share my move of shrubs and gardens) I love to watch them all. We can learn so much from them. We have had an huge influx of bunnies this year with some of them ginormous (at least my cat thinks so). You captured how fascinating they are. Sure hope you don’t use the binoculars on the neighbors…. You have captured the joy of bunny watching :-). Love it! So glad you enjoyed it. I know you love and appreciate nature. Seems you were given a beautiful gift–such a blessing! Even better is that you see the beauty and recognize the blessing–not everyone does. Thanks, Patricia. It is a gift to have so much beauty right in front of you. Nature is an endless source of pleasure. I’m grateful for the time to watch. loved the story of the yard bunny. I’m so glad that you did. Pingback: Garden Blessing | Small Town World . . . I am not sure what it is but there is something about looking at a picture of a rabbit that is immensely soothing. 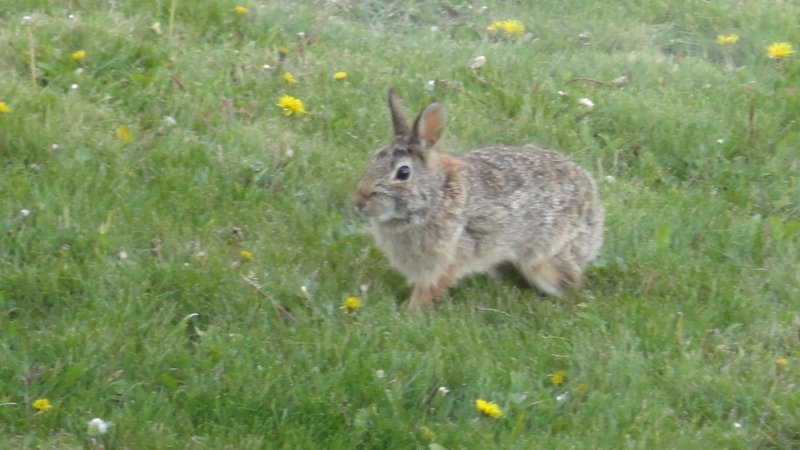 I hope your yard bunny remains safe and continues to enjoy chomping on the dandelions. Bunnies, puppies, and kittens – they make us feel good. Pingback: Bullet Dodgers | Small Town World . . .